I have to admit: this Deer Fly (more commonly known as a Get The @#$% Away From Me You @#$% Fly) was pretty. It was feeding on the nectar of these tiny Spirea blossoms (I’m pretty sure I could spend all day hanging around this one bush and find a gazillion different species). With its patterned wings, face dusted in yellow pollen, and rainbow-hued compound eyes, it was a pleasure to watch. I only noticed it after it shifted a little when my finger (which was poking a mosquito carcass) got too close for comfort. 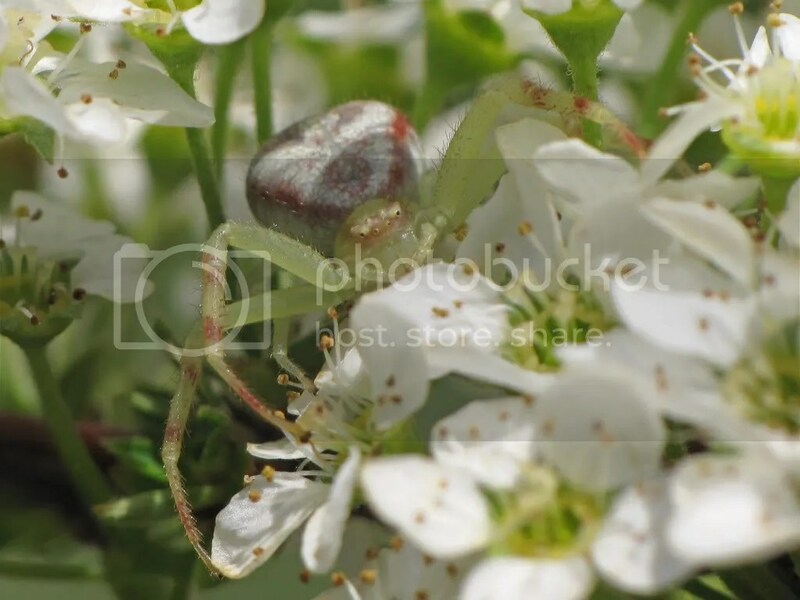 During my various ew-yucky-spider rants, I fear I neglected to include Crab Spiders on my (short) list of Spiders That Are Not Gross and Creepy. I think it’s their calm, patient demeanor and beautiful cryptic coloration that I admire and appreciate. Great eyes on the Chrysops fly – think I’ll try to get some eye shots of one of those guys with the 65mm lens this summer. The pollen actually caught my attention more than its eyes…it was so striking against the otherwise black body. Long-jawed orb weavers might be allowed on it too, but they make webs that are Gross and Stick On Me And Might Contain A Very Large Spider That Will Wind Up On My Face, so it’s iffy. Any spider can be on the list on a TEMPORARY basis, as long as it a) did not sneak up on me and b) is not on my person and c) can be safely admired from a distance of at least 1 foot. Except wolf spiders. They are forever blacklisted as Gross and Creepy. Blech. One time my older daughter (then ~8) and I came downstairs to find the biggest wolf spider I’ve ever seen sprawled out in the middle of the kitchen floor. A saucer-sized spider just sitting there – my daughter was terrified, amazed, and entertained all at the same time. We clamped a plastic container over it, slide a sheet of paper under it, and let it go outside. She doesn’t particularly care for bugs and stuff now but still talks about that experience 6 years ago with glee! 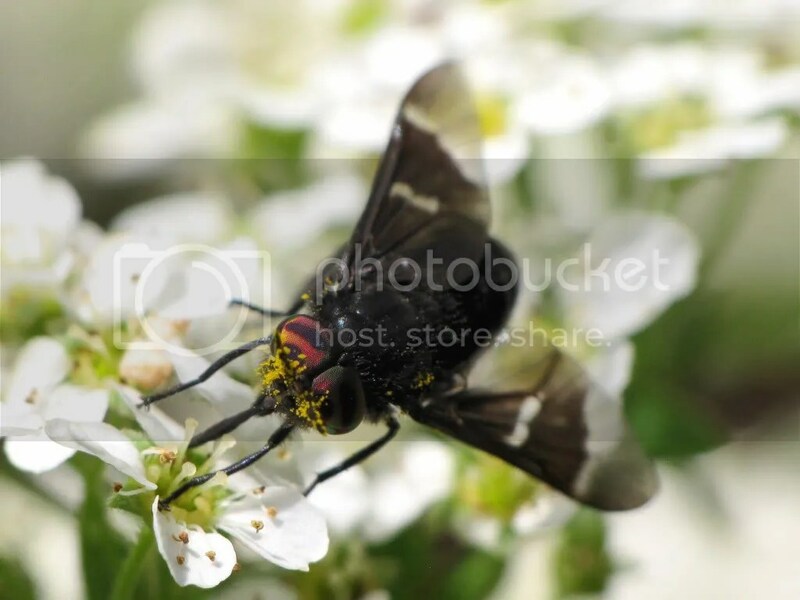 I am getting over my fear of spiders slowly….Those deerflies really hurt when they bite…. I figure three families is a good start 🙂 And yeah, the deer flies can be really brutal…they destroy my poor German Shepherd’s ears when we’re in the bush. I wish there was something safe (i.e. non-Deet-ey) I could put on her.